Are you looking into learning more about high school swim teams? In high schools that have pools and other swimming facilities, swim teams are often one of the most popular school sports, even having more recruits than football. Whether you are interested in figuring out how to get on a swim team or want to learn more about what a swim team is, keep reading! Generally, the different types of races a swim team will encounter differ either in the length of the race or the type of stroke used. For example, the 500 meter freestyle is a race that differs from other meter races in how long a distance is swam, while the 100 meter fly is a type of stroke used. Swim teams will generally compete against others. However, swim races are not just against one school. Generally, several schools will get together to have a meet and participants will compete against up to 7 others. Each student will get a lane of their own to swim in. It is important to stay in your lane or you may get disqualified. Something else that is important in the world of swim teams are records. Swimming is an ever-evolving sport and, as a result, time records are broken every so often. For high school teams, there are generally school records and records at individual conferences. This sometimes means that a student can beat a record, but still loose a race. For example, some can beat the school record in the 100 meter breast stroke, but may still loose the race at conference. Be a strong swimmer. If you have a lot of experience swimming already, great! 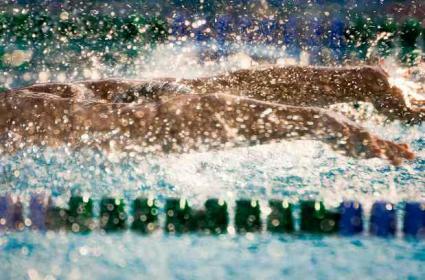 Get back in the pool and make yourself an even stronger swimmer. If you haven't swam a lot, then you have your work cut out for you. Find out what your high school's swim team requires. Some teams require participants to follow certain diets or regimens to make sure they are in top shape for performance. Find out what you'll need to do for tryouts and prepare accordingly. Many tryouts will find hopefuls swimming laps. Make sure you can swim a few lengths of the pool without tiring out too quickly. Make friends with someone already on the team. This can help you figure out what the team is looking for. Perhaps they're looking for someone with a killer breaststroke or who is great in relays. Having a friend on the team can give you an inside edge. Practice makes perfect. A great way to prepare for the races high school swim teams have is to swim competitively in your community. Look into races at your local swim center to see if you can go there to kick your swimming up a notch. What Happens When You Are On The Team? Once you are on the team, there are a few things you will need to keep a hold of. The first thing is that you will now have to go to practice. Many swim teams practice 2 times a day (before and after classes) and on the weekends. There will normally be a dry land practice (such as a run) and a pool practice (where students will swim). Another consideration is academics. In order to stay on the team, you'll need to keep your grades up. Some students may find balancing practice with classes and friends difficult. Try to find the balance that works best for you. If you join the swim team in high school, you won't be bored! However, it can be a large commitment so be sure it is something you are passionate about prior to pursuing it.